Sustainable travel doesn’t mean that you have to sacrifice style. These days, you can enjoy the high standards of a five-star property and still be good to the environment. Committed to protecting land and sea with an eco-consciousness across elements of design, food, nature, community and even energy, here are five stunning hotels around the globe that are high on luxury and low on the impact to our planet. What do you know about Ecuador — the Amazon, Galapagos Islands and Charles Darwin’s theory of evolution? Well now you also know about one of the world’s most unique locations to experience nature and luxury, Mashpi Lodge. 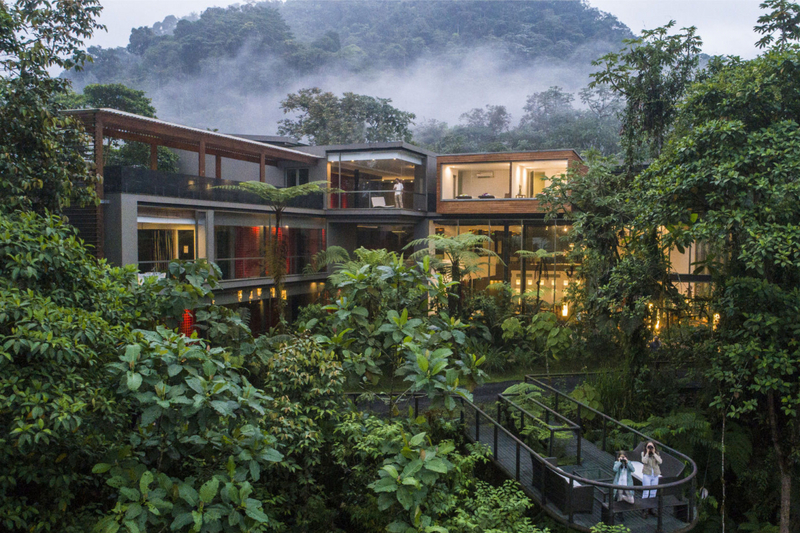 Located in one of the planet’s most biodiverse hotspots and private forest reserve, the lodge sits deep in the cloud forests and lush, green jungle. The reserve also acts as a research centre and protected space where guests, and the world, can benefit from learning about the nature and wildlife there. Plus, the lodge is powered 100% by hydroelectricity which is waste-free and produces no nature-endangering emissions. Escape to Koh Rong Islands, the second largest archipelago of Cambodia, and discover eco-luxe haven Song Saa Private Island. The resort is spread over two untouched tropical isles with stone and thatch-roofed villas — built from local materials by local hands — dotted along the rainforest canopy and on the waterfront. Situated in a self-made marine reserve that has been created to safeguard surrounding reefs and marine life including turtles, seahorses and exotic species of tropical fish. A dedicated team of marine biologists make up part of the in-house team, where recycling, conservation and waste initiatives are in place. What’s more, they work with local communities to support organic farmers and sustain social missions including medical and education programmes. Located in the Qing Cheng Mountains, considered the birthplace of Taoism in China, Six Senses Qing Cheng Mountain is the ideal location to explore Chengdu’s natural environment. Designed to complement the UNESCO World Heritage & Natural Cultural site nearby Dujiangyan, the resort also looks to improve its ecological and carbon footprint with programs in place to conserve energy such as electric car charging stations, reusable glass bottles which can be filled with their own purified and mineralised drinking water, and produce sourced from the local community and their own organic garden. Social commitments have also been made for an upcoming partnership with Panda Mountain and a sustainable education program to support local schools. Perched over the Indian Ocean is Gili Lankanfushi, a bare-foot luxury resort that holds a sensitive approach to the environment and ecological balance of nature. Located in one of the largest lagoons in the Maldives, the luxurious overwater villas are built on wooden stilts using sustainable materials, harvested from the island to ensure minimal disturbance to the environment and surrounding marine life, while also providing 365-degree views of the ocean. In a bid to reduce plastic use and wastage, the rooms provide refillable organic toiletries and the island’s desalination plant offers reusable bottles for still and sparkling water too. There is an abundance of luxurious ski chalets in the Swiss Alps, but how many of those are cool enough to be powered by ice? The Valsana Hotel is. High up in the Arosa, in the the Graubünden mountains of eastern Switzerland, this luxury boutique hotel runs on 95% recycled energy with a self-sufficient ‘ice battery’ which utilises waste heat from every day appliances. The interior of each room is also decorated with recycled furniture and coconut fibre mattresses. While ecological cleaning products, minimum packaging, paperless news (displayed on blackboards) and locally sourced ingredients in their restaurant add to this eco powerhouse of a hotel.